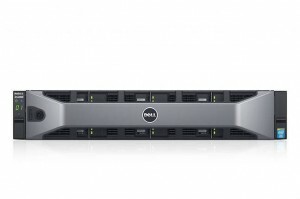 Dell announced the SCv2000 series storage arrays back in May of 2015. I’m a bit late to the party here, but I wanted to wait until I had actually had the opportunity to integrate several of these systems into customer environments. These systems start at about $10k via the Dell website, so there has been a lot of interest in this one. I’ve read a few articles suggesting that the SCv2000 series is aimed to replace the Equallogic product line, but after spending some time with the product and its pricing, I think it is more directly targeting certain portions of the Powervault space. Perhaps reducing business with LSI/NetApp (who make some products for Dell in the Powervault Line) is a goal here. The product comes in 3 different configurations. A 3.5″ 2 U arrangement (image above), a 2.5″ 2U arrangement, and a 3.5″ 5U arrangement shown below. This is the SCv2080, the dense version of the SC2v000 series. If you think it looks a lot like the Compellent dense storage enclosures, aka the SC280, that’s because it utilizes the same chassis. From a hardware perspective, the SCv2000 series leverages hardware used elsewhere in the Compellent product lineup. The SC2000 and SC2020 share hardware components with the SC4020. The SCv2080 utilizes components from the SC280 Compellent Dense enclosures. The SCv2000 series is a Compellent based storage array, and has many of the same features as other products in the lineup. It does not, however, have them all. As of this writing, the SCv2000 series is also the only product in the family that offers SAS direct connection capabilities. This product is not designed to seamlessly integrate into an existing Compellent infrastructure. It can replicate, but not to other Compellent based products, so this is really not being positioned as a younger sibling to the SC4020. There isn’t a direct, easy path between the products (today anyway). Its more like a younger cousin… that lives in a different house. The SCv2000 series doesn’t tier across different types of disk, so this is a big differentiator between this solution and other Compellent based solutions. The SC4020 and SC8000 all tier across disk types. The SC2v2000 series will tier across RAID types, which is unique in this product space, but it won’t tier across different types of disk. So, if you have an SCv2000 with 24 x 10k rpm drives, the system will automatically tier between RAID 10 and RAID 5 within that one pool of disk. That will provide great advantages from a performance and capacity perspective, but doesn’t deliver all the efficiency of true tiering across disk types. Like every other Compellent system, you get great disk pooling to accompany this, so you don’t have to worry about figuring out those RAID groups or add drives in a particular increment. This system doesn’t have a web interface. Its configured using a direct connection from a Compellent Enterprise Manager GUI, which is a bit different than the other SC products. Over 500TB, with plenty of horsepower for some fairly high IO configurations. FC, iSCSI, or SAS front end connectivity. Tiering inside a disk type. There is a lot of flexibility in this system, which tends to present itself as a good option for those environments where tiering isn’t key to success. It also makes a great showing from a price position, with a base price around $10k. 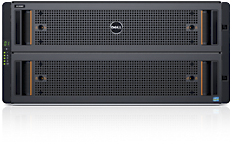 If you are in an environment that doesn’t require tiering, ask your friendly Dell partner about the SCv2000 series. *UPDATE* I just found a post by WTG Tech Guru and Dell Rockstar BVTechie on the SCv series. He’s got some more detail here. Read up! This article assumes you already know a bit about the Dell Compellent product line up. If you have any questions about this product or others in the family, post them below!